Home & Garden Woodworks Shop Online and Order Today! 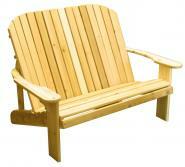 HOME & GARDEN WOODWORKS handcrafts outdoor Adirondack furniture using quality western red cedar lumber (thuja plicata). Cedar wood is naturally aromatic and has a richly textured grain with colors ranging from mellow ambers, reddish cinnamons and rich sienna browns. Each piece is made individually by hand, giving attention to detail and comfort, as if we were building your outdoor furniture for our own use! Pride in workmanship is our motto and our goal is your satisfaction and enjoyment of our garden and patio furniture for years to come. Order online and your Adirondack furniture will be on its way quickly to you. Of course, we're always ready to take your order or answer any questions you may have by telephone.